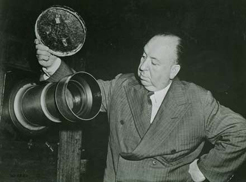 Alfred Hitchcock is the first director many people come to recognize as an “auteur.” In college film classes, Hitchcock is often the basic grammar for imparting the notion of personal style, because in no other filmmaker is it so easy to discern persistent themes, persistent techniques in composition, cutting and suspense, and, more importantly, a persistent relationship between theme and technique. In contrast to Ford (where a film’s elements are frequently posed at odds with each other), in Hitchcock there is not much difference between the way a Hitchcock movie looks and feels, the story it tells, the characters it portrays, the meanings it has. Indeed, Hitchcock’s compositions, particularly in the 1950s, sometimes resemble those of a Futurist comic book: simple and melodramatic graphics; startling and dramatic use of light and shadow; rigid expressions on the characters. (John Ford’s daughter, when she was told how Hitchcock would draw entire sequences of a film at his desk before beginning production, exclaimed, “No wonder his films look like that!” (2)) And invariably cited (and analyzed) in evidence of Hitchcock’s greatness are textbook sequences as in The Birds (1963, the attack on the gas station) or North by Northwest (1959, the crop duster attack) that have an Eisensteinian, storyboard feel: we experience them as analysis already on first viewing. In Psycho‘s (1960) shower scene, the horrifying is extended and reaffirmed with each cut and slashing graphic. Hitchcock’s cutting and camera movements can be equally bold and intrusive, again like some Russian Futurist. They call attention to someone not only watching the story happen (as the camera pokes curiously through windows and around rooms or stares piercingly at a character’s every movement or invades even the heart and mind of a character to see and feel everything he or she is feeling and seeing), but also telling the story (by willful choices of what to look at and what angle and light to see it under), and also leading the events (by cuts that shock and that disintegrate spatial continuity and by camera movements that emphasize inescapable time), with the result that Hitchcock’s characters often seem not so much to be living their lives as to be enduring them while they travel roads already planned for them, roads that for all their apparent senselessness (e.g., North by Northwest, The 39 Steps , Suspicion , Vertigo ) lead them toward a fate apparently inevitable, whether pre-ordained by character, by fate, or by chance — or by merely the foreknowledge of the camera, or of God. Claude Chabrol, in 1954, confronted Hitchcock with the accusation that his pictures contain the concealed theme of a search for God. People suffer, die, or go insane. Was it truly inevitable? How much control do we have over our lives? Do our wills matter? Or do horrible happenings proclaim the absence of God in the cosmos? Are we ourselves merely the victims, or are we somehow responsible? These are traditional Catholic questions and Hitchcock explores them persistently from first movie to last. To this viewer, Hitchcock’s movies seem least rich when plot and storyboard are moving them, most rich when the characters’ aliveness in a physical world (in time: in long takes) is moving them—the Renoir, Rohmer, Bresson, Rossellini side of Hitchcock. What Hitchcock’s technique puts across superbly is the subjectivity of his characters. He urges us to identify with them and share their inmost hopes and fears, their solitude. Here is the expressionist Hitchcock who learned his craft from Murnau and Lang (and Vidor and Chaplin). Yet at other points in his movies Futurism dominates and Hitchcock roboticizes his actors, with the same result as when Chaplin roboticizes the Tramp in Modern Times (1936). Vertigo is obsessively concerned with its character Scottie’s attempts to focus reality, but James Stewart’s comportment is so stiff, inhuman and robotic, his character and emotions so reduced to icons, that like Lang in Metropolis (1927) Hitchcock seems to be emphasizing concepts (and the machine) at the expense of human reality; indeed Scottie, not knowing who Scottie is, reconstructs himself with Madeleine, only to learn he doesn’t know who she is either — nor does she: so where is human reality? In contrast to Vertigo‘s theoretical woman, are the real persons incarnated in Joan Fontaine (Rebecca, 1940; Suspicion) or Ingrid Bergman (Notorious, 1946). How might Scottie have fared, had he become entangled in one of these? These are not concept women; their relationship with Reason and Ratiocination is flirtatious and victorious. They tend to be “flower children” who live in the moment, hear emotions more than words, and have trouble relating to people other than sexually; but with these women, in contrast to Vertigo‘s Madeleine, we can always feel someone there, struggling to keep faith with her vision of things. Hitchcock’s compelling drama is our fear of losing our self — a possibility in the 1930s films, a menace in the ’40s, an accomplished fact in the ’50s. In Rear Window (1954), Stewart’s mobility is reduced to a wheelchair, which makes grotesque his chronic ability to get out of himself and contact reality, and which reduces his personality to voyeuristic impulses. The question, also the question for Scottie, is whether his images/interpretations will fit reality or whether he is merely imposing them on reality (as Norman bates does in Psycho): thus in Rear Window the confrontation with the murderer is played like a confrontation with the id and revealed with a blinding (Cartesian/Jungian) flash(bulb). It is no longer possible in Rear Window, Vertigo or North by Northwest for people like Fontaine’s or Bergman’s character to exist in a Hitchcock world. Concepts have replaced nubile emotions; characters are subordinate to Hitchcock’s excitement machine: functional more than human. From the 1930s through the ’60s, Hitchcock characters find themselves increasingly bewildered between voyeurism and self, between outer and inner realities, between an increasingly mechanical cosmos and decreasingly human emotions, and Hitchcock wants us moviegoers to calculate who we are as, robot-like, we construct ourselves in relation to what we experience. What is the morality of our own voyeurism? Are we entertained at watching murder? At watching someone go insane and suffer? Hitchcock’s roboticized actors suit what Robin Wood identifies (perversely) as the “essence of Hitchcock”: that notion that “ordered life depends on the rigorous and unnatural suppression of a powerfully seductive underworld of desire.” (3) But Hitchcock’s actors are more nubile before their director turned 50, and delightfully frolicsome in the British movies of his mid ’30s. Young Alfred must have felt odd growing up a despised Irish Catholic in Protestant England (sort of like growing up black in Alabama) while in Ireland the Irish were fighting the English for freedom; he clearly is more interested in desire than in order — which, like John Ford, he often depicts as peculiarly English and the brunt of endless jokes. (His self-created TV image came to epitomize Englishness as much as the Queen or Robert Morley; but his cockney Tramp is equally an elephantine lampoon of Englishness — and its paranoia at the prospect of disorder.) Order, in Hitchcock’s dark, serious movies, is enslaving more than liberating: Shadow of a Doubt (1943), Notorious, Spellbound (1945), Strangers on a Train (1951), Psycho, Marnie (1964). Nonetheless Hitchcock shared Chaplin’s dilemma over how to maintain a working-class perspective while enjoying power and wealth. Hitchcock in Hollywood, like Vidor before him, fought at first to film average people on location (Shadow of a Doubt, I Confess , The Wrong Man , Psycho) and even glamorous ventures like Rebecca, Notorious and Marnie were designed from the perspective of a working-class character suddenly thrust into the meshes of the rich and powerful. 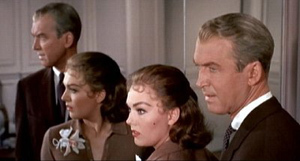 Yet Hitchcock’s heroes are increasingly well off themselves, and are increasingly drawn by Hitchcock like Futurist cartoons consciously designed for “The Big Screen” — well tailored cover boys (Stewart, Cary Grant, Rod Taylor) who never lose their poise and female mannequins in raucous make-up, fragile hairdos, high heels and tight skirts — to the point where disaster in The Birds is marked less by gouged eyes than by disordered hair. Yet characters’ emotions rather than Hitchcock’s storyboard machine are still the heart of the myths he designs. Bresson’s constraint leaves Bresson’s characters open to kaleidoscopes of changing emotions even while engaging in the most mechanical tasks; Hitchcock’s constraint concentrates Hitchcock’s characters’ attentions onto a single emotion or conflict. To the fear of losing oneself is added the fear of losing God. In The Wrong Man, The Balestreros remind us that most great mystics were bourgeois. Their sense of reality is routine yet they are conscious of their deep fears, of the contingency of everything, of the need for heroism in routine lives. They examine their consciences constantly. Manny Balestrero’s faith is as concentrated as his double bass playing; despite everything that happens to him, his sense of God never stumbles; indeed, he prays for a miracle and it comes. But Rose with obsessive concentration feels she is failing, and she is. What happens to Rose is more important to Manny than what happens to him, and to Hitchcock too: indeed, she may be his richest character. The Wrong Man‘s obvious plot (Manny’s arrest and trial) highlights the wrong man as a kind of baroque counterpoint to its real central character and real plot — Rose and her despair. Vera Miles might be Joan Fontaine or Ingrid Bergman ten years after, still a quasar emitting emotions, but now, lacking hope, she loses charity and faith as well, and feels herself damned. For a Catholic there is no greater tragedy. And the emotions flow not solely from the character, but from the shapes of the stuffed chairs, the tactile sense of the window’s glare of light upon them, the camera’s passage over a small arc of space and time. Barbara Ford to Tag Gallagher.